Who really wins more ISDS cases - governments or corporations? What campaigners need to know about a recent change in UN Investor State Dispute Settlements (ISDS) statistics. Last week the United Nations Conference on Trade and Development (UNCTAD) released its annual World Investment Report. The report is an important source of information for researchers on the notorious Investor State Dispute System (ISDS). It highlights trends in the global trade and investment system including new trade and investment agreements signed, changes in policy and reform efforts by governments. It also reveals some basic statistics on how many new ISDS cases are launched each year, and the overall statistics on the outcomes of ISDS cases. 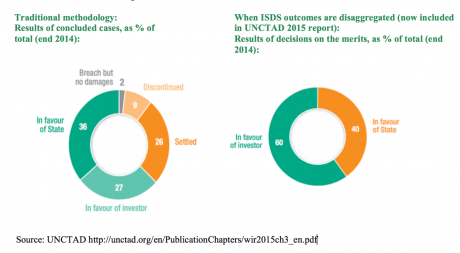 This year there was a change in the way UNCTAD presents this last figure – the overall statistics on the outcomes of ISDS cases. Understanding that change could provide a useful tool for campaigners in the current TTIP debates. On July 8th European Parliament members expressed their support for a TTIP deal in which a proposed 'new version' of ISDS would leave its most pernicious mechanisms essentially untouched. - How many ISDS cases have been won by the corporation (the investor)? - How many ISDS cases have been ‘won’ by the government that is being targeted (the state)? - And how many ISDS cases have been settled? Only corporations can bring ISDS cases against governments. Governments, therefore, can’t ‘win’ cases as such. Although we use the word ‘win’, the best possible outcome for a State is to not lose. liable for all of their own legal expenses – on average $8million. On the face of these statistics, States have won more ISDS cases than investors. This is why we often hear defenders of the system saying the system is not biased in favour of investors. They say that even the UN statistics show that States win more than investors do. So what has changed with UNCTAD’s 2015 report? This obviously gives a rather different picture of the ratio of investor-to-State 'wins'. In order to understand the change we need to understand the process that an investor must go through when bringing an ISDS case. The process has two stages. The first stage is a hearing to determine whether the tribunal has jurisdiction to hear the case; the second stage is to actually decide on the merits of the case – where the tribunal arbitrators hear the accusations of the investor and the defence of the government and decides who is right. With the traditional methodology used by UNCTAD the results of stages one and two were bunched together. So when they say ‘the overall number of concluded cases reached 274’, the 274 cases include both the concluded hearings on jurisdiction and the concluded hearings on the merits. When you separate the numbers out you can see that a significant proportion of the so-called State ‘wins’ are actually jurisdiction hearings where the arbitration was terminated at jurisdiction stage i.e. the claims by the investor did not come under the tribunal’s legal competence. When we look at the number of cases that actually got to the merits stage, we get a very different picture of the system. From the example above (end of 2013), the number of cases that actually got to the merits stage was 184 (the total number of ISDS cases - 274 - minus the 71 cases that were terminated at jurisdiction stage). Of these 184 cases in which the merits of the allegation by the investors against the governments were actually considered, investors have won 111. Investors have thus in fact won 60 per cent of ISDS cases where the case has actually gone on to a full hearing on its merits – considerably more than the 43 per cent suggested by the previous methodology. While this has always been the case, UNCTAD did not make it explicit in its reporting, until now (under pressure from campaigners). So the old simplistic defence that States win the majority of ISDS cases does not stand up to scrutiny. This greater transparency from UNCTAD will hopefully aid campaigners seeking to show the threat that the ISDS system poses to sovereignty and democracy, in TTIP and elsewhere. For more info, see iisd.org here and here.